MOSCOW (Reuters) - President Vladimir Putin offered a raft of financial sweeteners on Wednesday to hard-pressed Russians after opinion polls showed trust in him has fallen to a 13-year low and almost half the population believe the country is on the wrong track. 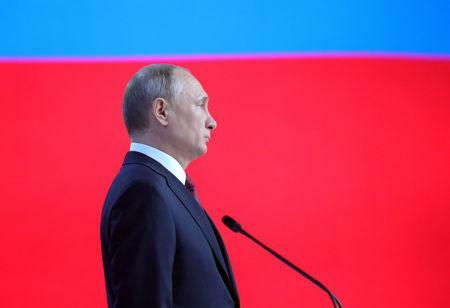 In his annual speech to the Russian political elite, Putin set out how he planned to raise people's living standards and boost healthcare and education, promising he would find extra money to back the pledges. Among his promises: More money for pensioners, mortgage and tax relief for families, and financial incentives for women to have more children. Putin also laid out deadlines to close huge and sometimes apparently spontaneous landfill sites that have become a political sore for the Kremlin and angered many Russians who have seen them spring up near their homes, polluting the air. "You can't deceive people. They keenly feel hypocrisy, disrespect and any injustice. Bureaucratic red tape is of little interest to them," Putin told lawmakers and regional leaders. "For people what's important is what has actually been done and how it improves their lives and their families' lives. We need to change the situation for the better now." Putin also spoke of a new arms race with the United States, something that could potentially reduce funds available for social spending if it continues to escalate. But for now, Putin said Russia was well able to afford to spend heavily on lifting people's quality of life. He said the country's foreign currency reserves covered the entirety of its external debt obligations for the first time and forecast the economy would be growing by over 3 percent by 2021. "...We can now invest and focus colossal, at least for our country, colossal financial resources on (Russia's) development. Nobody handed them to us, we did not borrow them - these funds were created by millions of our citizens. They (the funds) should be used to increase Russia's wealth and the wellbeing of Russian families." Oil revenues mean Russia is not short of money. Its budget surplus this year is projected to be 1.932 trillion roubles ($29.3 billion) or 1.8 percent of gross domestic product. Russia's foreign exchange reserves stand at $478 billion, the fifth largest in the world. But if Putin had to scale back social spending plans to fund a wider arms race, that could further dent his ratings. In power as either president or prime minister since 1999, Putin was re-elected last year by a landslide to another six-year presidential term. He is not under immediate political pressure and enjoys an approval rating of around 60 percent. But his rating used to be nearly 90 percent and an opinion poll in January showed public trust in him had fallen to its lowest level in 13 years, while another survey showed this month that the number of Russians viewing the country as moving in the wrong direction was at its highest since 2006. Pollsters attribute the souring mood to people fed up with six consecutive years of falling real incomes and unpopular government moves to raise the retirement age and hike value added tax.